One of six talented brothers from Geelong who all played senior VFA or VFL football in the last decade of the 19th century, Henry McShane briefly captained the Blues in his debut season at Princes Park, and later, played in Carlton’s first-ever Grand Final side. The McShane boys – Jack, Phil, Tom, Jim, Joe and Henry - grew up in country Geelong, where they were all prominent players in the district’s VFA side. By 1897, when the Pivotonians became one of the eight foundation clubs of the VFL, all of the McShanes had represented Geelong at some time in the club’s history. The eldest brother, Jack, had been vice-captain of Geelong’s 1886 Premiership team before passing away in tragic circumstances in 1887. 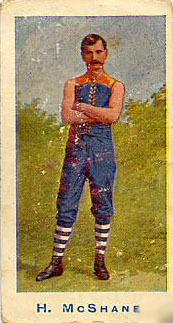 Henry McShane racked up 31 matches as a versatile utility for Geelong in 1897-98, before controversially departing to throw in his lot with Carlton. He was warmly welcomed by the struggling Blues, and his experience saw him appointed as captain of the club for ten games midway through his debut year of 1899. Three men; Ernie Walton, Will Stuckey and McShane shared the burden of captaincy that season, while Carlton churned through 21 players in a continuing search for new talent. The tide of mediocrity eventually turned for the Blues in 1902, when the club committee under President Robert Heatley made the monumental decision to appoint former Fitzroy champion Jack Worrall as Secretary. Worrall was to revolutionise the position; becoming the game’s first full-time coach. By design or circumstance, his arrival at Princes Park coincided with that of veteran ruckman Joe McShane, who also departed Geelong to join Henry, and the Blues. Within two years, Carlton was to play finals football. Midway through Worrall’s first season in charge, 33 year-old Joe McShane was appointed captain, while Henry was asked to give the team a lift by switching from defence to half-forward. Like most of Worrall’s ideas, these moves both bore fruit. A tough-as-teak ruckman with a streak of mean, Joe stepped up to be an exemplary leader, while Henry brought tenacity and purpose to the Blues’ attack. Worrall’s iron discipline took Carlton from sixth place on the ladder in his first season in charge, to third in 1903. In September of that year, the Blues had their first taste of finals football, going down by just four points to eventual Premiers Collingwood. In a gripping Semi Final at Fitzroy’s Brunswick Street Oval. Former captains Ernie Walton and Henry McShane were Carlton’s standout performers. Carlton’s opponent in the club’s landmark first Grand Final was the red-hot Fitzroy, who had finished six points clear on top of the ladder and comfortably accounted for Collingwood in the Second Semi Final. More than 32,000 spectators packed into the MCG to see the Blues begin the match with confidence, and lead by a point at half time. But Fitzroy’s steadiness and superior accuracy in front of goal eventually saw them kick away to win by 24 points. That game marked the end of the senior careers of both McShane brothers at Princes Park. Aged 31 and 35 respectively, Henry and Joe retired together after a combined tally of 130 games for the Blues – including more than forty occasions when they were members of the same team. After football, Henry spent his time as the publican at the Elms Family Hotel in Spring Street in Melbourne. Henry McShane passed away on the 1st December, 1912 aged 39. "Mr. Henry McShane, formerly a member of the Geelong and Carlton football teams, died on Monday at his residence in Spring-street, Melbourne, after a long illness. His remains were interred yesterday morning in the Melbourne General Cemetery. The Rev. Father Duffy conducted the burial service." Click below to read an article on the McShane family from The Argus June 23 1934. Contributors to this page: Grisdesa , blueycarlton , pblue , Bombasheldon , PatsFitztrick , WillowBlue , molsey , Jarusa and admin . Page last modified on Thursday 21 of June, 2018 15:01:29 AEST by Grisdesa. 2002 - Scott Camporeale article (Dec 02). 2003 - VFL Alignment of Blues & Bullants still unofficial (19/3/03).